Before I get into my recap of what I DIDN’T do last evening, I wanted to acknowledge that my National Runner’s Day post was easily the worst one I saw. First, I got the day all wrong. What I thought was Runner’s Day (like, the day where you honor and celebrate that special runner in your life and gift them with new shoes) was actually Running Day, a day celebrating the sport of running and our love and joy for it. I saw lots (and lots) of beautiful reflections of what running means to people and how it has changed their life. So, I totally dropped the ball on having a meaningful Runner’s Day. But I really enjoyed reading everyone else’s thoughts. 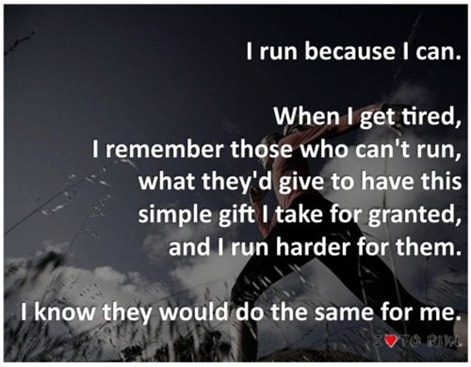 It is so great to see how so many people have found themselves through running! And it kind of felt like a joyous runner’s Christmas. So much goodwill and shared excitement! Nate, the lead singer is from Phoenix and a few years ago he was in a band called The Format. Aaron, who was living in Phoenix at the time was a fan. I know they had a following here, and even in Northern California where I was, but I don’t think they were quite mainstream. So, when this song came out in a Super Bowl Commercial, not only were we in love with it, we were also excited to see that The Format dude had found himself some new bandmates, they were producing some pretty neat stuff, and they were getting major exposure. Last night they were scheduled to play in Santa Fe. It was actually a free show (probably booked before they become one of the biggest bands in the country), so we were prepared to battle some high school girls for optimum audience placement. I ran my miles in the morning, I arranged to get off work early, I burned the album onto a CD and listened to it on loop both on my commute and in the office all day. We were pumped and ready! So very sorry to announce we have to cancel tonight's show in Santa Fe due to Nate being sick. Stay tuned for a rescheduled date. Apparently Nate was deathly ill with a fever and cough and couldn’t perform. They are playing at Bonnaroo this weekend where Christina will get to see them, and probably being well for that performance is a bigger priority (they were on Jimmy Kimmel on Monday and the MTV Music Awards on Sunday. They’ve had a long week). Today’s post was supposed to be a lovely recap of the fabulous time I had at the Fun. concert. I was going to have pictures of the band up close and personal, and there may have been a video of me jumping up and down in true fan girl style while they sang Some Nights. But sadly none of this could happen. I’m not a huge concert person. I pretty much go see Journey every time they come because I LOVE JOURNEY SO MUCH, and I did have my Huey Lewis phase. But I’ve never been a huge “let’s spend money on concerts” person. I was REALLY looking forward to this concert. Aaron was annoyed because the last time The Format was supposed to play in Albuquerque, the same dude got sick, they cancelled, never rescheduled, and never refunded tickets (that show wasn’t free). So I’m hoping they reschedule. Looking at their tour dates however, it seems kind of unlikely. They are pretty much going non-stop, then heading to Europe. I hate catching bands at the end of tours because they are so obviously worn out, but I’m guessing they won’t head to Albuquerque to conclude their tour right after flying in from Portugal, so I don’t know. We may have missed our chance to see them for now. After that disappointing news, we had all evening to do nothing. We both ran beforehand, so we literally had hours on our hands. There may be something to this “get it over with first thing in the morning” thing, because having a full evening to run all our errands was actually pretty convenient. To console we went to a vegan Thai restaurant (called Thai Vegan no less). Aaron tried (like, really really tried) to convince me not to order the tempura, but I was bummed enough to mask my sorrows through deep fried veggies and soy shrimp. I immediately regretted it. I’ve always known that the “healthy” part of this marathon training would be the hardest. Life goes on, and today will hopefully bring less concert drama and less fried food!